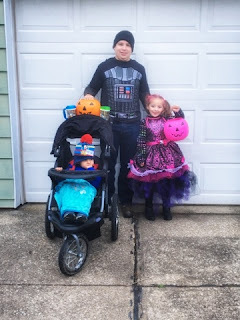 There's just a few more recaps from Halloween I want to back-up and show you a glimpse of. We had two carve-able pumpkins. 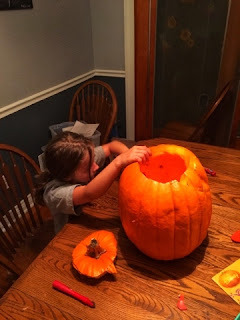 The plan was supposed to be Brian carved one and I helped Ella with hers. She had other plans and didn't want any help. 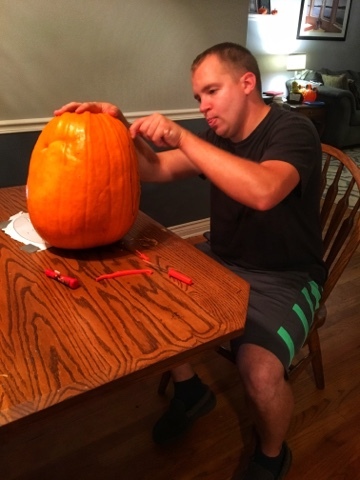 Austin wanted nothing to do with the pumpkins or the guts. Look at her focused face. Here were the final results. 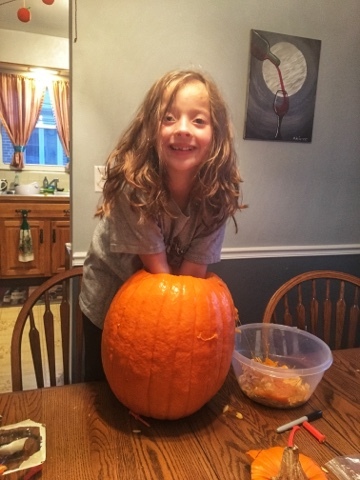 Ella carved a Pumpkin Face as she calls it. 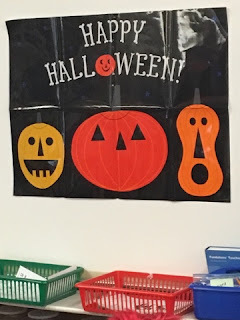 He had two eyes, a nose, a mouth, and two ears. (last year she also gave her pumpkin hair). 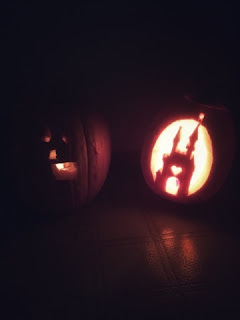 Brian carved the castle with the heart and Tinkerbell ball at the top. No we don't have a Disney obsession at all. All Hallows Eve. I surprised everyone with donuts and latte's for Brian and I.
Ella changed her mind at the last minute and wanted to be Draculara from Monster High. 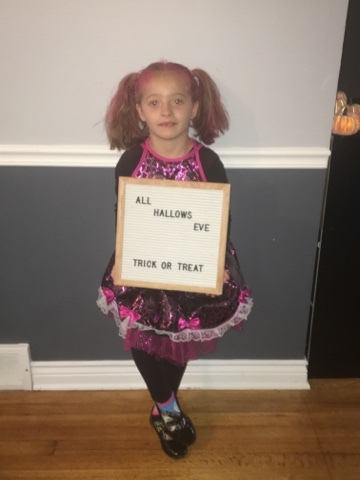 Her father had brought the costume over the night before. He had also brought a wig but she didn't want to wear it all day at school, so we went with pink pigtails instead. This girl had so much energy yesterday morning. 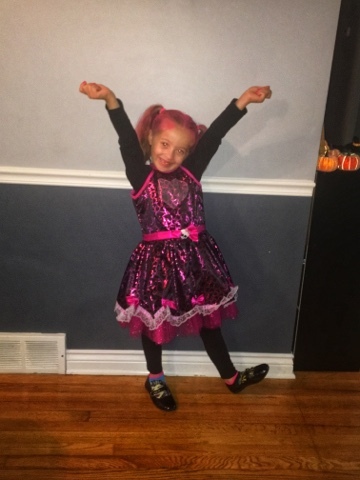 She was so excited for her school party, to show her friends her costume, and to go Trick or Treating. I love Aubriella's school. To our surprise when I dropped her off yesterday morning all the teacher and staff that wait outside to open car doors to let the kids out were all dressed as Waldo. (Even though Ella had no idea who Waldo was, we have to work on that) Everyone had on matching red and white stripped shirts, stocking caps, and glasses. She really has the best school. 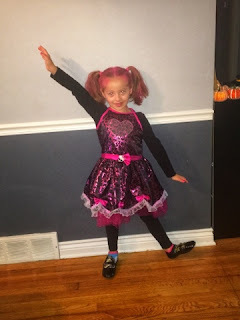 At Ella's school they had a Halloween parade for parents to come watch all the kids walk around in costume. I was at the beginning of the parade and it took 10 minutes to see all the kids. After the parade the kids went back to their rooms, parents left, and kids had a party. I was lucky enough to volunteer to help at the party in Ella's room. 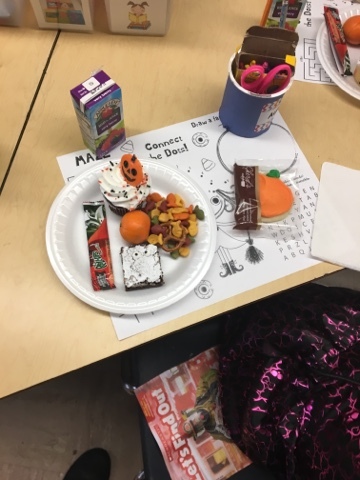 Each kid got to eat a brownie with cute candy eyeballs, a delicious cupcake, goldfish, pretzels, fruit roll-up, pumpkin shaped sugar cookie, an orange, and a juice box. They also colored a bag and some kids brought in treat bags to pass out to each kid also. After the kids ate the PTA donated some games for them to play. 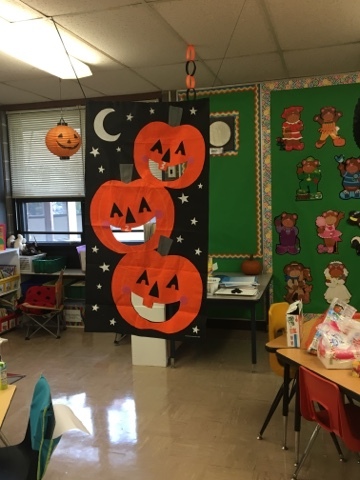 We had pin the smile on the Jack-o-lantern and pass the pumpkin to Halloween music (which was like hot potato). 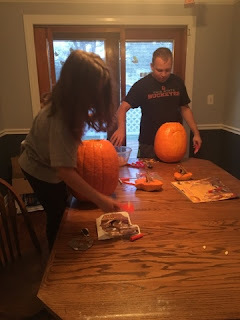 The kids favorite was the pass the pumpkin. Aubriella's teacher also had a bean bag toss. The boys especially liked this game. 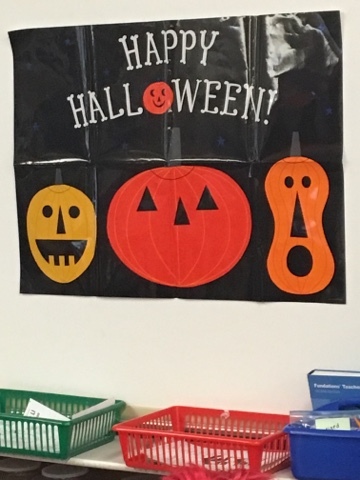 I knew that Halloween was going to be a busy day. I planned a quick delicious dinner of just pasta with red sauce and garlic bread. 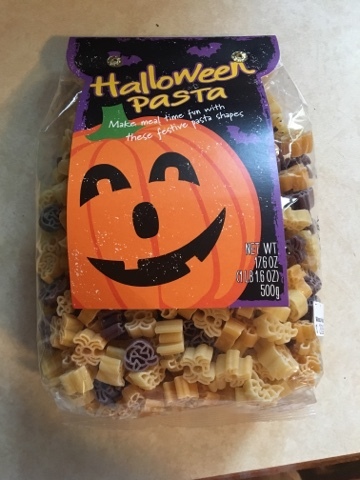 I found this really cute Halloween Pasta at World Market that had different shapes, pumpkins, spiders, and bats. It also was only made with four ingredients. I never realized how many ingredients are in normal pastas. Time for Trick or Treating. 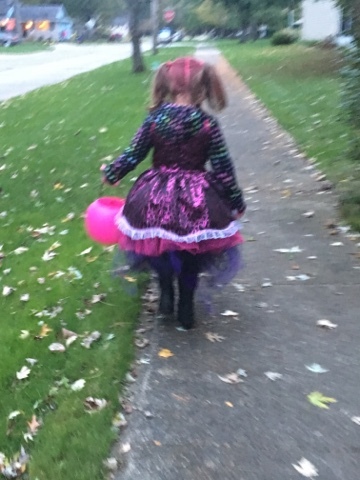 Ella decided that since her hair was pink still she couldn't be a purple witch, but wanted to wear her tulle witch skirt under her Dracula costume. It was a cold night (felt like 33 degrees) she had on two sweatshirt, two pairs of socks, jogging pants, gloves, boots, and her costume. She never complained of being cold. Austin was dressed as Superman. He had layers of warm clothes under his costume, kept his shoes on, two pairs of socks, his hat, mittens, and was wrapped in a blanket. His little nose and cheeks were red when we got home though. Brian was had a Darth Vader shirt on with a cape. He complained his hands were cold, but wasn't prepared with gloves. I was nice to give him my gloves. I wasn't dressed up. My Batmom shirt wouldn't fit over my coat and I was more concerned with staying warm then dressing up. Aubriella led the way. She had lots of fun, we went to lots of houses, and got lots of candy. Most of the candy was candy bars, a couple King size candy bars, and mostly stuff they will eat. 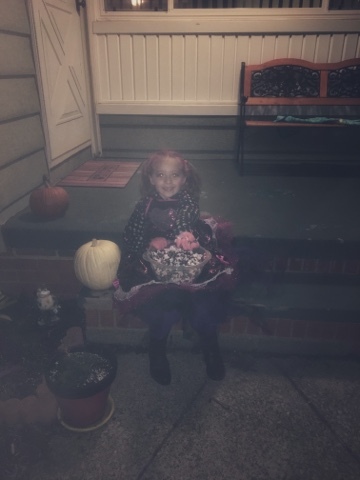 Ella lasted until 7 (it started at 6) and wanted to go home and pass out candy. We had bought some tootsie rolls to pass out incase we were home. I wanted something I knew would get eaten and we could give handfuls of. We got home at 730 and only had 2 kids until 8. We have so much candy. Hope you had a fun and safe Halloween.